Make your '97-'04 (Heritage) Ford F-150's Hood stand out with this great-looking Raptor style Hood Graphic kit. This stripe package is not just a rectangle of vinyl in a box. Our graphic kit consists of a prefitted and contoured piece as well as simulated side vents as shown in the illustration. 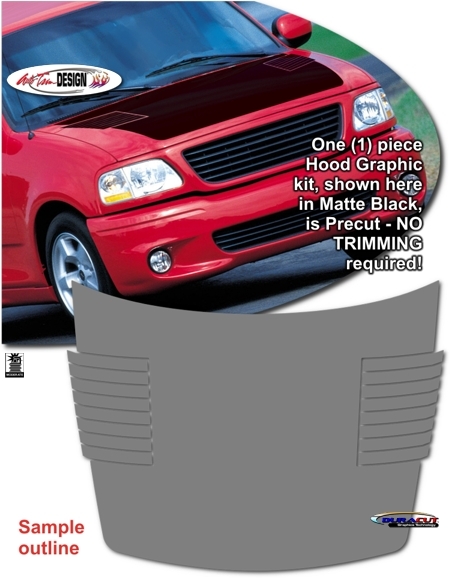 Kit is specifically made for the '97-'04 (Heritage) Ford F-150 factory Hood and will not fit any other vehicle. Graphic is designed to be placed approximately 1" (25.40mm) from the rear Hood edge at time of application. Also, windshield washer nozzles are required to be temporary removed and re-installed after successful application of graphic. Due to overall size of the graphic as well as the curved shape of the F-150's Hood, it may require assistance of another person for proper application. We suggest starting installation at the center of the graphic, working towards the outer edges. Please refer to the product Parts List for helpful Installation Notes.